Our stonemasons have many years experience in all types of stone projects. We are best known for our unique native Connecticut fieldstone work, although we also often work with bluestone and pavers. Typical projects include patios, walls, and walkways. View our Stonework Portfolio to see examples of our Patios, Walls, and Walks. 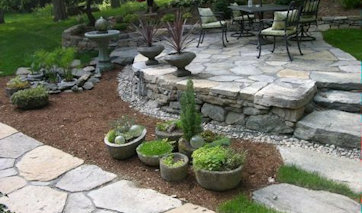 Contact Sprigs & Twigs today to discuss your Stone Patio, Wall, or Walk project.